We just *love* writing bios for siblings! Siblings were family before coming into foster care, and they deserve to be together as family long after their time in care is over. It’s their right, and it’s our job to help make that happen. 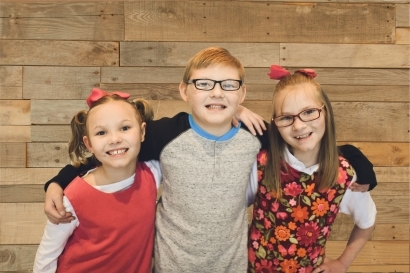 So here’s a bio for three siblings – big brother Deven and his sisters Angelyn (or Angie) and Abgayl (or Abbie). Folks, these three are a hoot, but as you might guess, their lives are a little complicated. Anytime kiddos come out of trauma, they react differently, as alike as they may be at their cores. Deven creates and builds amazing things using his hands, but he can be a little disorganized and a little too focused on “stuff” – the right clothes, the right games, the right things. And, he can struggle with authority at times. Angie is a fascinating, multi-faceted young lady, but she struggles with low self-esteem and shyness and she sometimes doesn’t process her emotions in an appropriate way. It also takes a little longer than she’d like to calm down when she gets upset. Abbie is a true sweetheart – outgoing, happy, and very affectionate – but she has a lot of catching up to do to be as mature as other kids her age. She can be impulsive at times and a little difficult to re-direct, not because she is a “bad kid” but because she just doesn’t realize that what she is doing is problematic. But the great news is that these behaviors are absolutely going to get better with time, patience, and support. In fact, all three kids have made great strides during their time in care, and each is poised to blossom in their own way in the right environment. Deven, Angie, and Abbie each have a wonderful, beautiful, happy spirit as their foundation…they just need the right family. What does that family look like? They need a family committed to routines, structure, and consistency with experience parenting kiddos already. If this sounds like your family, let us know.